Everyone has a different way of celebrating the holidays. Some go full-throttle, wearing a different “ugly” Christmas sweater for every day of December, decking their halls (and the entire exterior of their homes) with more lights than Paris, and practicing for a perfect cork-pop on New Year’s Eve. 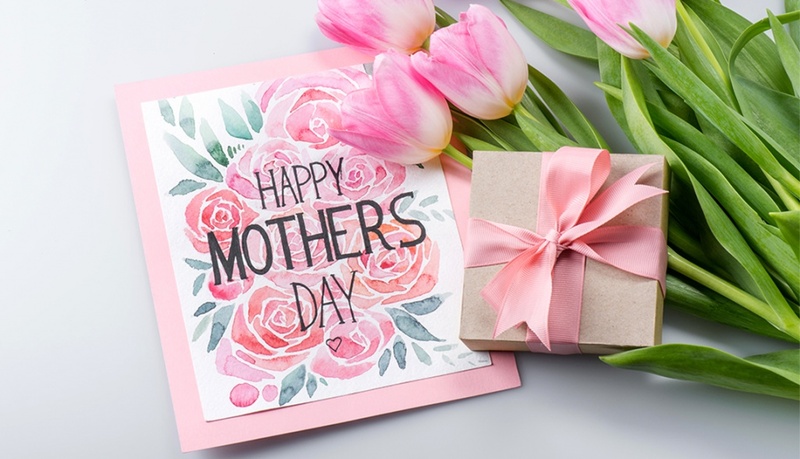 Others prefer a more subtle approach, hardly dabbling in the traditional red-and-green shades of the season, preferring hints of sparkle over in-your-face festiveness. The same goes for holiday manicures. If you’re picturing your nails covered in three-dimensional merry motifs — perhaps a cotton-bearded Santa and all of his reindeer, complete with pointy antlers and working light-up nose for Rudolph — there’s a nail artist who can make that happen for you. Prefer a simple coat of silver that will take you through to 2019? Your polish options are endless. There’s really no wrong way to get your nails ready for the holidays, but if you’re having a hard time deciding on what manicure to get in these jovial last couple weeks of the year, we’ve rounded up some of our favorites. From Instagram’s greatest nail artists to Fashion Week inspiration to our very own editor in chief Michelle Lee’s lovely hands, you’ll find the perfect holiday-party mani that’s right for your particular level of spirit. 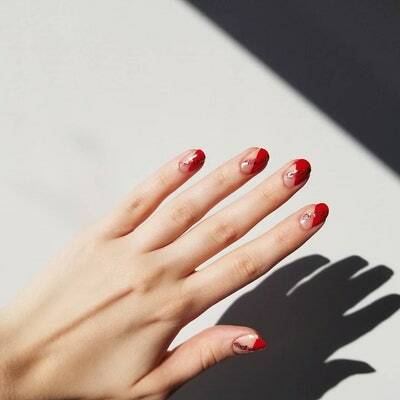 There was no need to expertly dot polish onto the red and gold base of this manicure — manicurist Marisa Carmichael used tiny, reflective stickers for an extra-perfect finish. Manicurist Mar y Sol Inzerillo is responsible for our latest holiday nail obsession: this red-and-white-striped candy cane imitation she posted to Instagram with the caption, “????❣️❌⭕️❣️???????????????????????? Candy cane peppermint patty #nails are always a good idea! Don’t you agree?” Of course we do. This mesmerizing manicure by Hamptons-based nail artist Regina Rodriguez is all you need to accessorize any basic black and white party look. The shimmering rainbow hues will catch the light wherever you walk, so people are bound to be asking you about your digits all night. 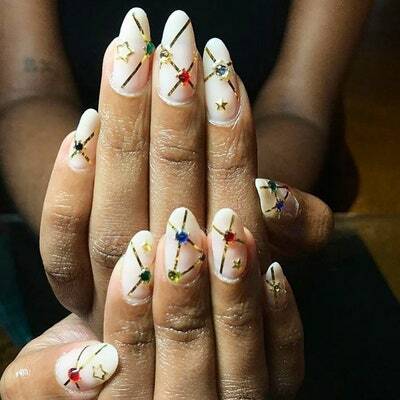 The nail artist known as @fresh.claws on Instagram made this gorgeous holiday look come to life with different coloured jewels and metallic accent, which gave the finished look a whimsical “Christmas lights” effect. 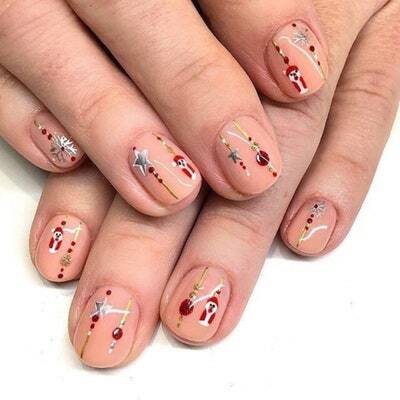 Nail artist Katie Masters took Christmas cuteness to new levels with this nail look, which consisted of tiny bird-inspired Santas and dainty holiday trinkets, like cranberries and hanging ornaments. An organized cluster of sequins, diamond studs, and stars made for the most epic festive mani on Glossier founder, Emily Weiss, which was created by nail extraordinaire Naomi Yasuda. 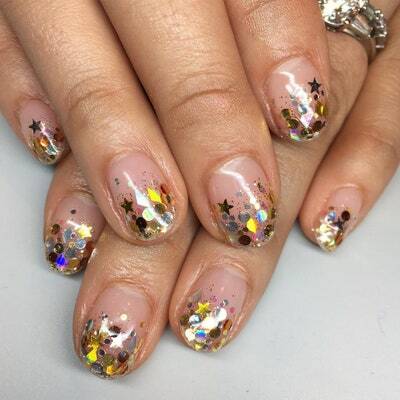 Mia of @superflynails on Instagram is responsible for this work of art consisting of little gold stars and silver circles set over a clear base. 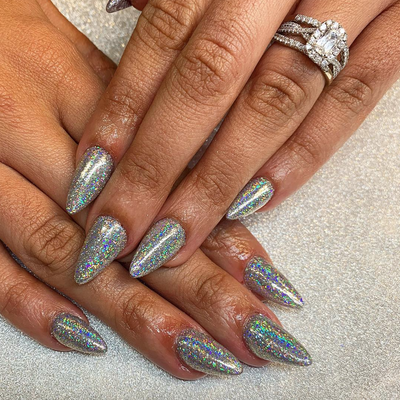 It’s simple yet super festive: Los Angeles nail artist Glennis McCarthy coated her client’s nails in what she calls a “green glitter bomb” as a glamorous way to celebrate with a single colour. Classic red is perfect for Christmas on its own, but the stripes expertly placed by London-based nail artist Jay Deau make her client’s ring-finger nails look like they’re wrapped in pretty, plaid paper. Prefer gold over silver? 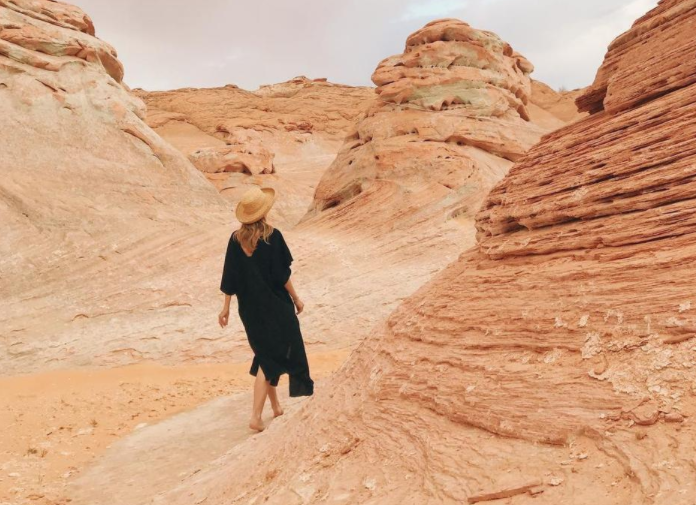 Try a look like this one sported by Allure editor in chief Michelle Lee. “I’m not opposed to Santa or snow globe nails but if you don’t wanna get that wild, I love a metallic on negative space or a neutral base,” she says of her manicure on Instagram.